I am moving to a new office building. I have been living in “the hole” (lab/shared office/cellar command centre) since 1996. 15 years of no windows (unless you count the Bill Gates kind), a door you have to close to read the white boards, lab equipment, Einstein posters, reference books, binders, tasting glasses, CDs, coffee paraphernalia and people. Always people. From the farthest recesses of my drawers I dug out some treasures too. Pictures of my life starting a winery in a new country with a new family. Building new vineyards. Designing and constructing a winery. Our first public wine tasting. Old buildings where we made our first vintage. Old friends who have moved on and old friends who are still my dearest friends. When the desk was cleaned out, right down to the pencil lead and bits of fluff caught in the corners, I looked at what I had amassed. Two boxes and one bag, all fitting easily on a rolling pushcart with room to spare. 15 years on a rolly cart. I felt a bit demoralized as I pushed it out of the lab… across the cellar floor I had watched being poured years ago…out the big wooden doors that were built by two guys in the winter of 1996 in a hoarded up corner of the cellar… to the crush pad with my name carved in the concrete… past the amphitheater which had always been my dream to have if I ever owned a winery… and into the new building. Into my new office. A housewarming gift from the cellar workers sat on the new, empty desk…an ice bucket complete with all the fixings for making martinis and a beautiful card signed with heartfelt wishes for my move into the new digs. I tucked the card into the back recesses of my new desk. Time to start making new memories. 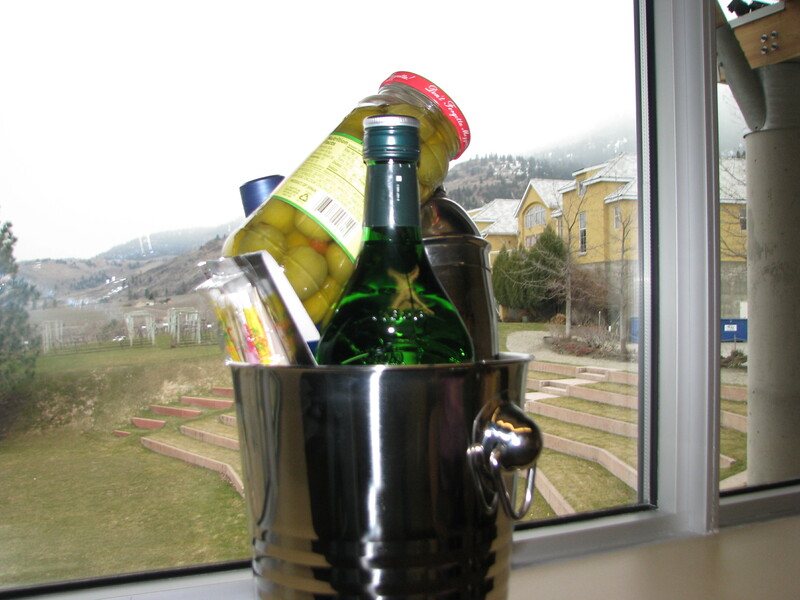 This entry was posted in Personal Sandra, TInhorn Creek and tagged martini, moving, Office, wine, winery. Bookmark the permalink. A great post, Sandra. Congratulations on 15 years of memories, and here’s to many, many, many more. So nice of you to comment. C’mon by sometime for a martini! time to start making martinis!!! Congratulations. It is wonderful to watch you make your dreams come true! Fun to read, and straight from the heart, well done Sandra. BTW, you had way more stuff than me when I moved 3 weeks ago! But to be fair, I was only 7 years in the same office. ENJOY the new digs! So glad you liked that one. They ended up in the circular file (garbage) although I probably could have got some $ for them on ebay!